Kiku Matsuda is one of the most famous blade grinders in Japan. With over forty years of experience, Kiku Matsuda has been grinding knives since he was 15 years old and is a fifth generation knife grinder. Using the Hamaguri-Ba grinding technique, he has produced the Japanese convex edge normally only found in the classic Katana sword. 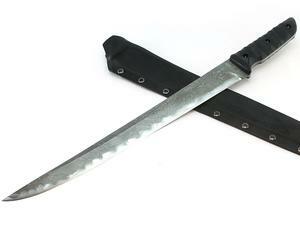 The Kiku Kagemusha is a large katana with a 15" OU-31 Hamaguri-ba blade with a taper grind. Features a sharp Kissaki tip, 5" hand contoured black canvas micarta handle. Includes a hand fitted kydex sheath with Tek-Lok belt device.